A charity dinner and dance hosted by a community organisation in aid of Grapevine has raised almost £3,800 to help fund a project that will see 40 young people with learning disabilities plan for the future they want over the next two years. The Great Gatbsy themed event at the Doubletree Hilton hotel in Walsgrave in November last year saw guests dressed up 1920s style, dining and dancing to Bollywood, Bhangra and Western music. 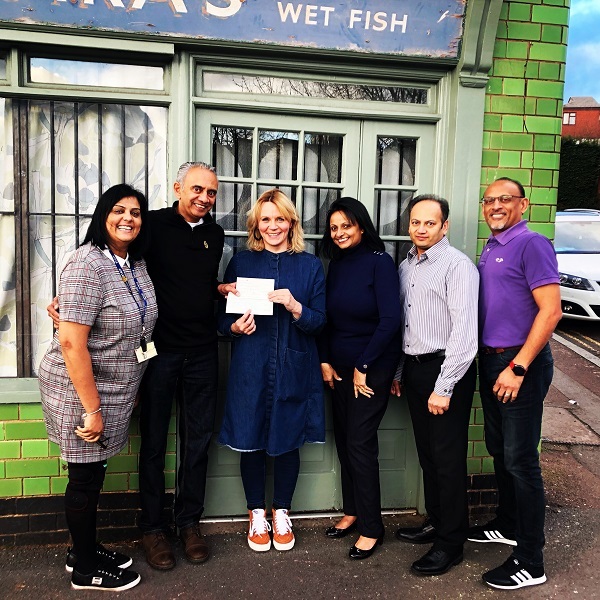 The donated money from tickets sold at the successful event can now be channelled into Big Plan training after some of the team from Leuva Patidar Samaj – Coventry, Rugby, Nuneaton (LPS-CRN) handed the £3,789.54 cheque over earlier this week. Included in the amount is £1,000 match-funded by Barclays and a donation of £150 from Jaguar Land Rover. The Big Plan will take the progress established by Grapevine’s Teenvine Plus project (and others over the last ten years) to a whole new level. Where Teenvine Plus helps bring together a circle of support around a young person who has a learning disability to grow their confidence, resilience and independence, the Big Plan sees them making plans for their future not on a 1:1 basis but alongside other people their age, plus their families. This means a far wider network of group supporters all contributing to and encouraging one another’s dreams and aspirations. The more people in the room, the more opportunities to discover talents and resources that can help the young people on their journey. The result is a Big Plan for a great life. Grapevine Deputy CEO Mel Smith said: “I am both humbled and delighted for the funds raised to enhance the work we do with young people. LPS-CRN is a member organisation affiliated to registered charity Leuva Patidar Samaj – UK. Its members are from the Surat, Navsari and Valsad districts of southern Gujarat in India. It has raised more than £20,000 over the last few years for other worthwhile local causes including the Air Ambulance Service and a children’s hospice. 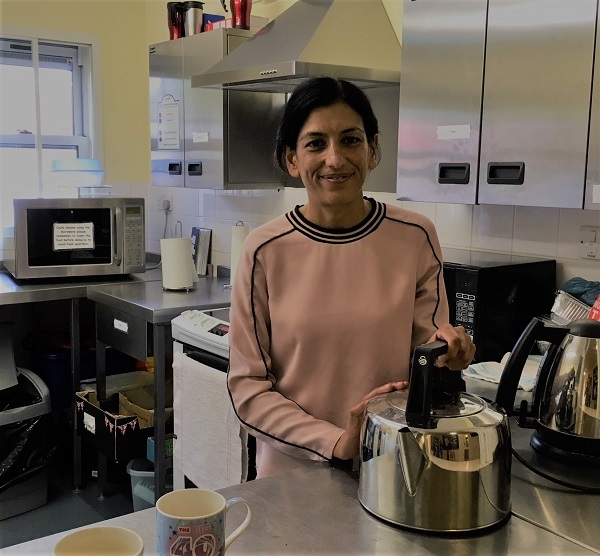 Kiran Patel, President of LPS Coventry, Rugby and Nuneaton said: “It was an honour to be a part of this project and raise thousands to support the great work that Grapevine undertakes. “None of this would be possible without the kind support and generosity of all the sponsors, raffle prize donors and the attending guests who whole heartedly support these events. Click here to find out more about fundraising or volunteering for Grapevine. Our final post of 2018. 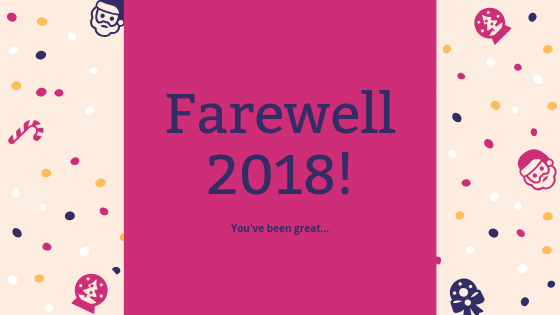 And what a year it has been. We’ve sparked new movements of people who care about an issue – Connecting for Good (isolation) and Self Care Social (long term health conditions/self care) – and grown existing ones with Feel Good Community. Longer term projects such as Help and Connect and Better Lives have gone from strength to strength, building the capacity of individuals and families to lead the lives they want and deserve. Accelerate continues to help people with a learning disability or autism find secure, paid work. System change in Willenhall through the Ignite partnership with Central England Law Centre has made tangible in-roads into nurturing strong communities who get early and effective help when they need it. And the young people involved in Teenvine Plus and Coventry Youth Activists have progressed in leaps and bounds throughout the year with – amongst other things – appearances on BBC Coventry and Warwickshire radio, a performance at the Godiva Festival and a weekend away to see a gig in Brighton! Phenomenal. The Big Plan is helping young people, alongside their families and friends, to think creatively about and plan for the life that they want after school. 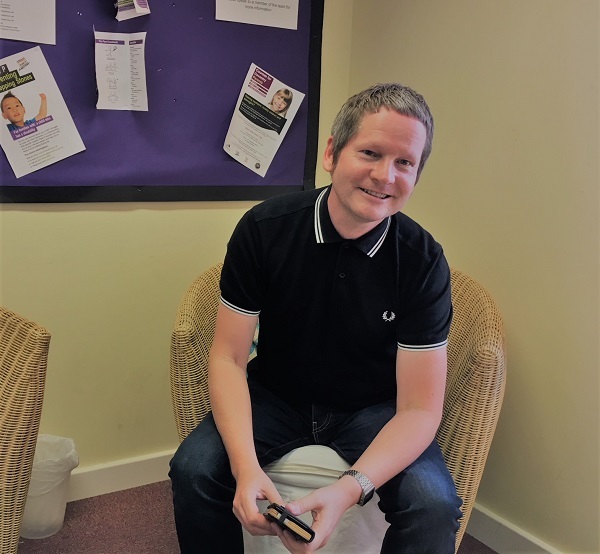 Plus our involvement in Warwickshire is expanding from Warwickshire Empowerment Service with the new Community Powered Advocacy service, aimed at people with a ‘vulnerability’ not receiving services from social care. Not to mention our CEO Clare Wightman travelling the length and breadth of the country making sure we’re at all the right tables for change. There is also some exciting news coming in January on two more new projects. Fingers crossed it is all we hope for. Wishing you a Happy Christmas and a peaceful New Year from everyone at Grapevine. Sitting across the table from John Toman and Ravinder Dhadda, it is easy to get a strong sense of the time and energy they are committing to making the Ignite partnership a success. John is the team leader of four Grapevine ‘connectors’ – himself included – and Ravinder, or Rav as she prefers to be called, is a legal advisor for Central England Law Centre. 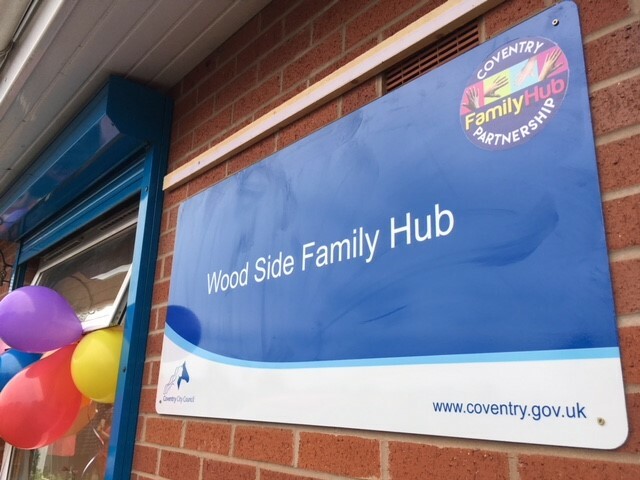 All are based primarily at Wood Side Family Hub – a Coventry City Council community facility in the heart of Willenhall. Combining a constant flow of ‘connecting’ work with sound legal advice for local people since Ignite launched two years ago this month, John, Rav and the rest of the team are really starting to reap the rewards of their joint efforts, agreeing that this summer has been “the best six weeks so far”. Those six weeks have seen Ignite trawling local primary school lost property stores for forgotten items of uniform and returning them to a clean, ready to be re-loved state with the use of the hub’s washing machine. Local families coming to the usual Wednesday hub grub club (more on this later) were able to browse the collection and take whatever they needed – without having to come to a dedicated event and perhaps feel a little embarrassed about it. The good will was subsequently returned when Mums and Dads who’d claimed items for their families, brought back their own outgrown uniforms for other parents to take home too. Rav said: “There’s no stigma attached to needing larger-sized uniform all the time – children grow at a rapid rate – but sometimes people feel it anyway. 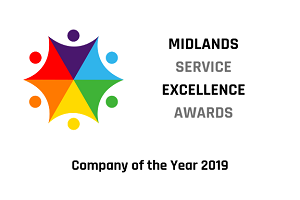 In fact, the uniform swap was such a success that next year John and Rav hope local groups such as Women of Willenhall (WoW) will take the helm, working with the community’s four primary schools and one another to keep it going. “The hub had previously been seen as a ‘provider of needs’,” says John. Recently, that help has also included the aforementioned hub grub club to combat some of the ‘holiday hunger’ experienced by low income families feeding children all day during school holidays. This can often mean a choice between buying food and paying rent. Some funding for the club came via the city council from national food poverty charity Feeding Britain and more came from direct food donations from the community. The work complements existing help for families coming from St. John the Divine Church in Robin Hood Road and Midland Langer Service which provides basic food for communal settings in three Coventry temples. 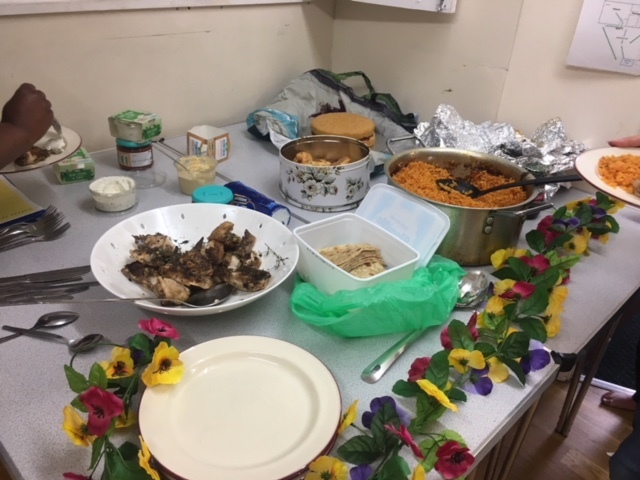 Midland Langer Service has been bringing food to the Family Hub each week – creating a ‘takeaway’ style feel to Wednesday evenings where local people can socialise and enjoy a hot meal together. Many children in Willenhall don’t have holidays away from home either, putting added pressure on parents to keep them entertained out of school. The Family Hub offers an outlet for this with an outdoor play area plus parties and workshops designed and delivered by groups such as Friends of Wood Side which was started up spontaneously by some local Mums. During term time there’s a homework club on a Monday run by a local teenager. These activities are just the tip of iceberg for the Ignite experiment, which has another two years left to run – with the hope of leaving a lasting legacy in Willenhall where public services act earlier, build community strength and release their capacity to solve many of their own problems as they arise. Find out more about Coventry’s family hubs here. Six women from Stoke Aldermoor are channelling their efforts into creating a social plan that could secure £250,000 of Big Lottery funding for their community. The group meets weekly at the local community centre to exchange stories and ideas about how they might transform their neighbourhood for the better. They also meet once a month at Catherine’s Church for a social supper with another six residents who are interested in helping. Some of the forerunners from the ideas pooled so far include opening a one stop shop in the area for support; more training opportunities for young people; improved provision for families to build parenting skills and raise aspirations; a family walking group; a summer school; and the creation of an annual festival to celebrate Stoke Aldermoor’s diversity and boost community cohesion. But this is no casual chat over a cuppa – these women with differing backgrounds, home lives and cultural heritage, are forging ahead with a joint plan to make these ideas happen. Women who may not otherwise have come into contact with one another had it not been for this common purpose. Together they want to make the neighbourhood they inhabit better – moving away from issues of crime, drug use, community tensions, inadequate access to local travel networks and feelings of isolation towards realising their vision of a safer, more cohesive place to live. They were connected by Mel and Dom from Grapevine who, together with Community Development Workers Lorna and Stef from Coventry City Council, had hundreds of conversations as well as listening events with local people. Mel and Dom join the weekly sessions, rallying the women to keep their eyes on the prize and helping them develop the best plan to attract the funding they want. 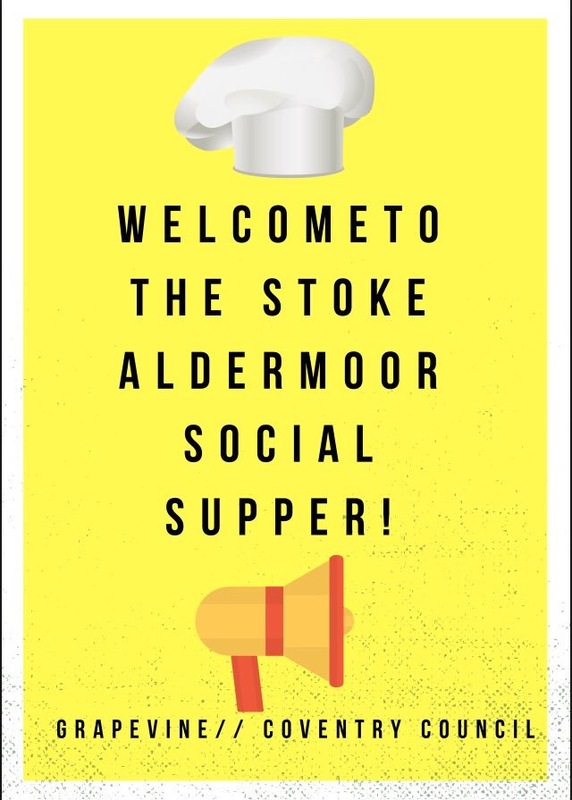 They bolster the group with support from the further six ‘social supper’ residents plus four associate members – from the local library, Aldermoor Farm primary school, Stoke Aldermoor community centre and St Catherine’s Church. Statutory agencies such as the city council are also remain in the mix, offering their specific expertise on neighbourhood services and local communities to the plan. More partner organisations have also expressed an interest in being involved. Dom says: “Everyone involved is passionate about making change happen. But for a long while, Stoke Aldermoor’s experiences as a deprived area of Coventry has affected its residents and the perceptions of those outside of it. “The frustration is how to change the area so people living there benefit from the same opportunities, neighbourliness and community pride we might see in other parts of the city. “That doesn’t mean these things don’t already exist in Stoke Aldermoor – we just need to build them up. The future generation plays an important role in the present, as the group continues to develop its plan. The son and daughter of one of the Group members – who is originally from the Congo in Africa – have received listening training from Grapevine so they can in turn consult with 16-25 year olds in the area. Dom continues: “We’re all trying to come at this with fresh eyes and an open agenda – what’s the dream and how can we get there? So who better to speak to young people than young people themselves? “And just because there are currently six in the group, plus another ten supporting from the sidelines, we realise many more people care about the future of Stoke Aldermoor. The deadline for the social change plan to be submitted to Big Lottery Fund is the end of October – so watch this space for news! International Women’s Day takes place every year on March 8th. Take a look at events planned. Keep up to date with what is happening on the International Women’s Day – Nuneaton and Bedworth Face Book Page. Every one got the chance to share their thoughts on what would make an amazing local Day through Ideas Factories organised by our own Dawn Nicholls. More importantly people pledged their support to help make it happen! Coventry Youth Activists are planning their first event to celebrate World Day of Social Justice – Tuesday 20th February 2018. World Day of Social Justice is a day recognising the need to promote efforts to tackle issues such as poverty, exclusion and unemployment. Ideas Factory – Get involved! 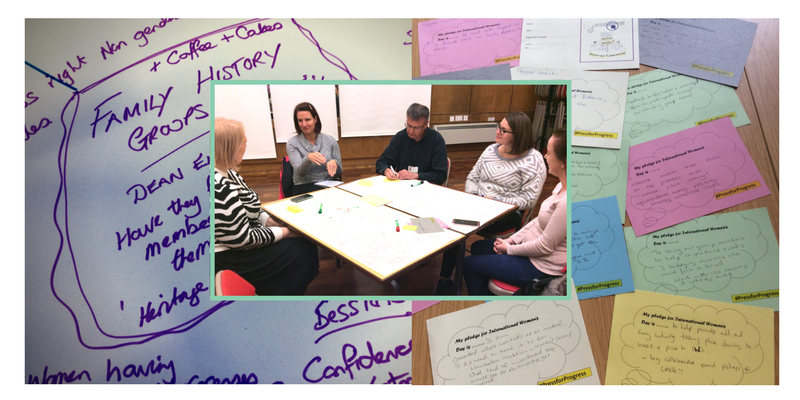 Dawn from our Grapevine Empowerment Service has been working with Nuneaton & Bedworth Council to host their first Ideas Factory. 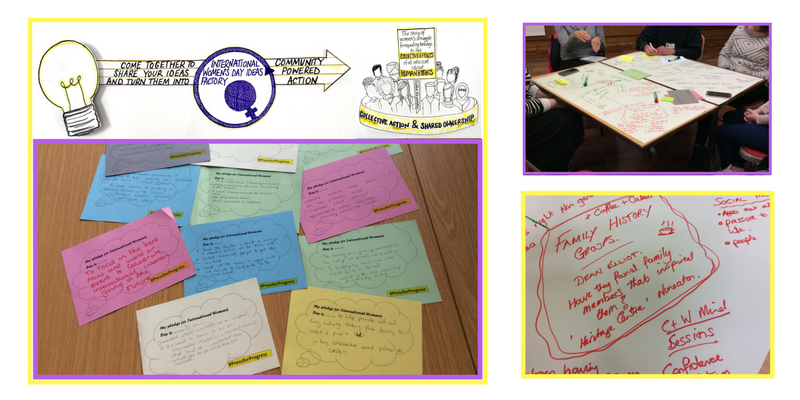 Fourteen people gathered in Nuneaton on a wet cold Thursday evening to share ideas, skills and resources to shape what International Women’s Day could look like in March 2018. There was great energy in the room with a diverse group of people from the local community. Inspirational stories were shared and ideas were generated by local people. 15 pledges were made on the night which ranged from exploring local heritage, engaging with local dramas, faith, support groups and schools through to celebrating the achievement of local women whilst still pressing for progress on gender inclusion. Without a plan, it’s hard to make important changes in life. Grapevine helps people to make a ‘person-centred plan’. We listen to what people want in their lives and bring everyone together to create the plan and make it happen: family, friends, community members and services.